There are two types of filament that are used with the CoLiDo printer. Both of them are thermoplastic and can be heated and cooled over and over again. This is important because any material must be able to be manufactured as a filament, stand the process of heating and cooling a second time whilst being used for printing, and to be able to settle into the right shape once printed. The two types of filament are a) acrylonitrile butadiene styrene or ABS and b) polylactic acid or PLA. They have different properties and are introduced below. This material is often seen as more environmentally friendly and it is an example of what is known as a “biodegradable bioplastic”; these types of plastics are becoming more commonly used. It is usually made from corn starch, from specially grown corn but in Africa and Asia may instead be made from tapioca root or sugar cane. It degrades naturally into harmless lactic acid, however the degradation can be controlled – for example, some medical uses would require that the object degraded within a certain time within the body. The melting point is about 150-160oC and it does not need to be used with a heated bed so is available for cold surface printing although it works better with a heated bed. It is not suitable for printing using an acrylic surface as it would bind to it. Another feature of PLA is that no harmful fumes are produced when printing. Soft PLA is bendable 3D printing material that feels like rubber. 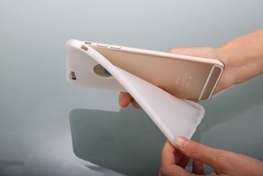 You can use it to print objects such as this mobile phone cover. An object printed using PLA has a smooth, shiny surface and more detail can be added than if ABS is used. You can use a higher printer speed too; this is because the PLA is more viscous at a lower temperature than ABS. PLA can give much sharper definition of detailed parts of the object than ABS if cooled quickly. One disadvantage of PLA is that objects are less robust than ABS and it is less suitable for printing interlocking parts. 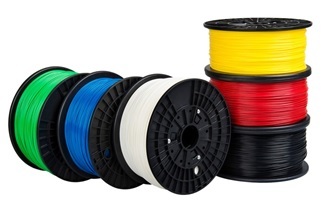 PLA should be stored in its original packaging prior to use as it can degrade slightly which may result in discolouration and poorer print quality. In summary, you can achieve more detailed results, there are no harmful fumes and it is environmentally more “friendly”. This may be of relevance to you when using it in a desktop printer and when children are around. This is a hard, sturdy material that is more durable than PLA. It is made from oil, and comes in different grades depending what it is used for as it is used in many industries. OObjects made from ABS are hard wearing and strong, lightweight and with a long lifespan. It is suitable for hot surface printing and has an extrusion temperature of around 225-230oC. If it is not used on a hot surface it is liable to deform, or warp (such as curling up where it meets the print bed) and it contracts when it is cold. You should make sure that the object and heated bed allowed to cool down before removing it from the bed. One of the disadvantages of ABS is that it is made from oil therefore it is liable to give off odour and fumes when heated so you should ensure adequate ventilation when printing. Colourants are added to ABS and this can have the action of making the filament firmer. This means that coloured filaments can be thinner to counteract this property. It also takes less force to extrude the heated ABS than it does to extrude PLA. It’s easier to make objects such as interconnecting parts and you can stick them together using acetone. An example of an object made from ABS is this Big Ben model. ABS is more suited to engineering and mechanic use than PLA. However, there can sometimes be slight rounding off of sharp corners which may affect the usability of the part. This can be countered by increasing cooling around the printer nozzle but care must be taken not to overcool because then the layers will not bind together correctly. ABS should be stored in its original packaging prior to use. Long term exposure to air means that it can sometimes absorb moisture which, when the material is heated, will affect print quality.